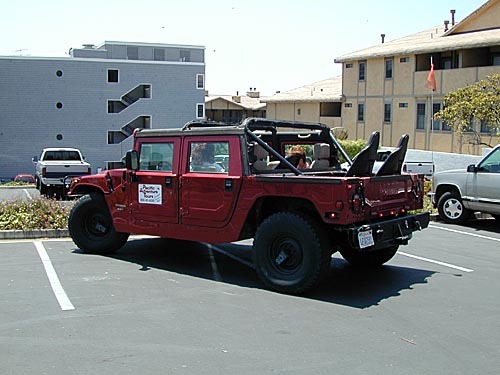 Here's the vehicle we toured in, a Hummer equipped with three extra seats for a total of seven. Here's our driver. 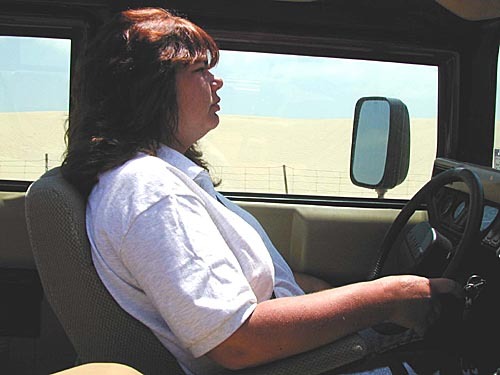 She's the substitute driver, as the Hummer's owner was out of town. Here are my tour companions, Brad and Kelly I think their names were. They took the pair of seats in the rear cargo space. I sat in the front passenger seat. The cloth seat on the left is a stock rear seat in the Hummer; the black seat is one they added. The front passenger seat turned out to be a poor choice for photography, since I had to shoot most of my pictures through the windshield or the side window. You can spot the reflections in some of the pictures below. On the dunes! 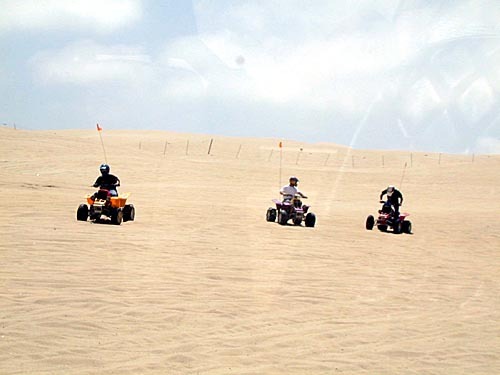 Here are a few four-wheel ATV's playing nearby. The white truck got stuck in some soft sand, and the others were working on getting him out. 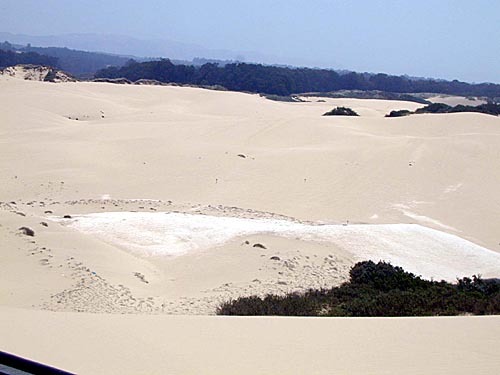 The dunes end rather abruptly. There's actually a lake visible here in the scrub just behind the dune line. The driver claims that this white swath is leftover clam shells from an old Indian village. 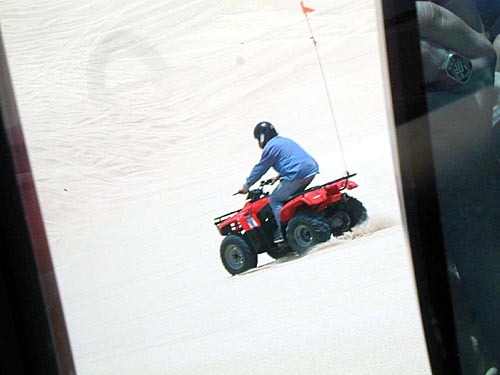 This ATV is zooming in front of us. Shot between the right windshield pillar and the right rearview mirror; you can see my hand and Rice ring in the rearview mirror. Look again. Yes, that motorcycle is really in the air flying over the pickup truck. He jumped off a dune just offscreen to the right. There was a semi-organized jumping activity going on. 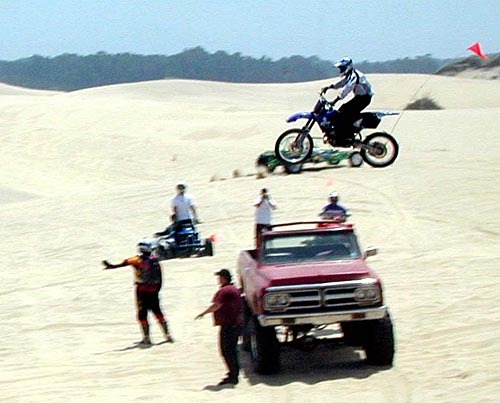 Most of the time the guy in front was sitting on top of the pickup, watching traffic to the left, and signaling riders when it was safe to jump over the dune. When this rider wanted to go over the truck, the lookout wisely got down from the truck! 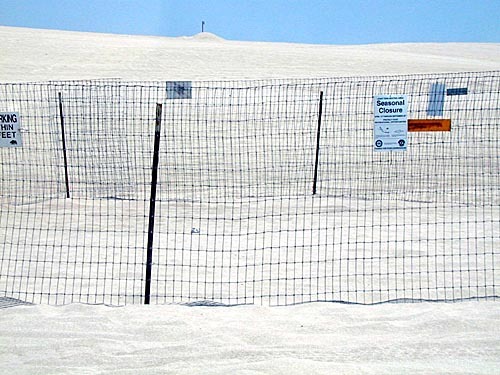 There are fences around all the areas of plant growth to protect them from the vehicles. There is barely room for trucks to pass between these two areas of plants to reach another open area. King and queen of the hill. 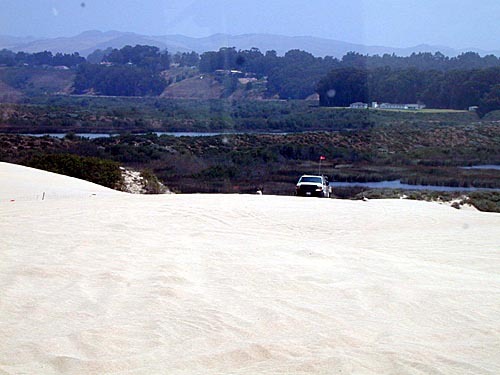 The driver stopped at the far back end of the dune park and suggested that we walk under a fence and climb this dune, for the view of the lake beyond. This funny gizmo on the wheel is part of the central air system. No, not air conditioning, air pressure control. 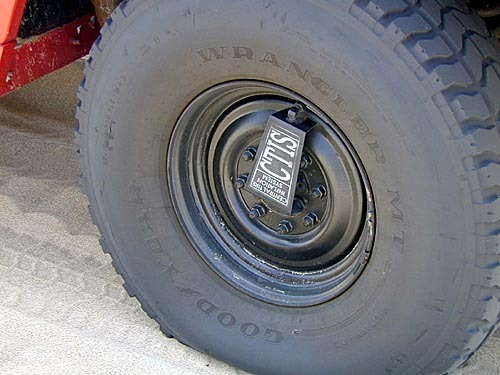 The driver can raise or lower the tire pressure without getting out of her seat! 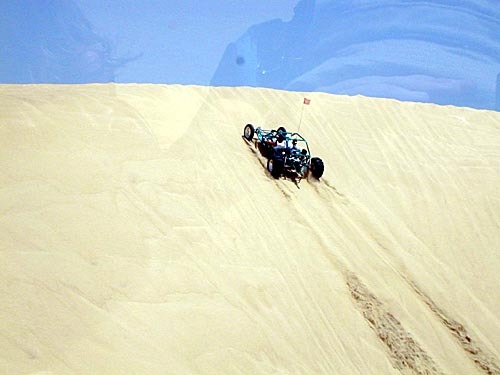 This is very handy here on the dunes, because you get the best "float" over the sand with underinflated tires, as seen here. Then you want to pump them back up to normal when you get back on the pavement. 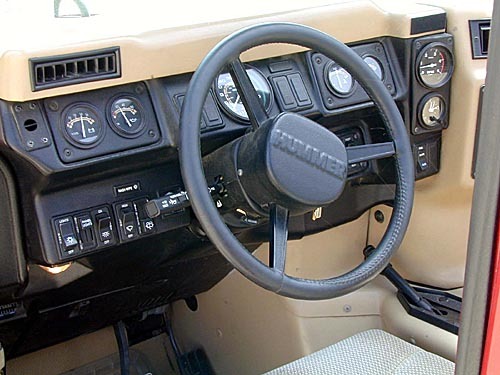 The Hummer's cockpit. Lots of instruments, but rather austere for an $85,000 vehicle. This dune rail was able to climb straight up this steep dune, with a bit of a running start. We didn't try that one in the Hummer. There are also fences around nesting plovers, who are in the silly habit of building their nests in the middle of an open beach. Not too smart when it's in the middle of an offroad vehicle park. The rangers find them and put up fences. 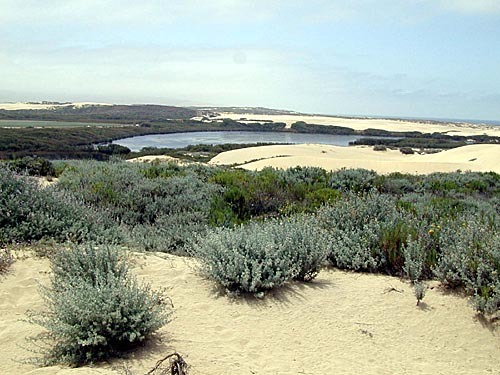 There is a plover nesting in the middle of this picture; can you see it? 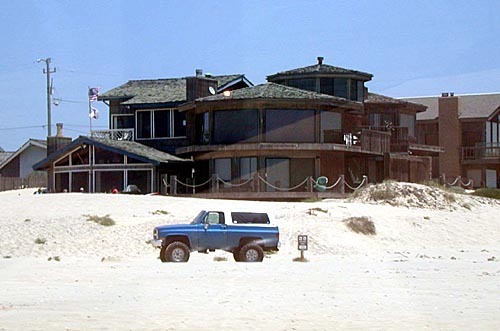 Houses like this one are built right up to the beach. Mostly they are rentals, kept full all the time, and probably expensive. Note the truck on the beach -- Pismo Beach is the only place in California where you can still drive down the beach. 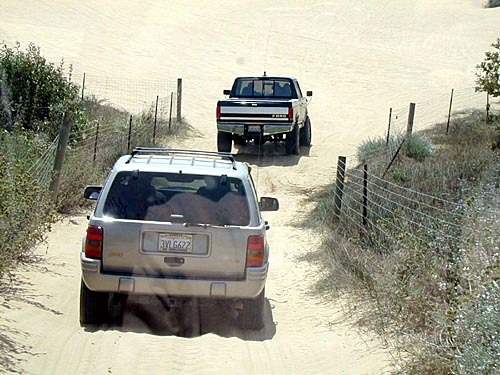 Here we're on our way from the dune park down the main beach toward the road access.